The allure of the archive is found not only in the rich original evidence of the past that it contains, but is also demonstrated by what the archive may lack. The nature of the organization of records and the proclivity of the record creator determine the composition of the collection. In other words, a single archival collection may not contain all of the information or materials created on a certain person, event, or organization – it may not offer the whole story. This aspect of the archive sends the researcher on an unending hunt for information, each turn determined by obscure clues found amidst some of the most unassuming records. in the gallery – a fine catalog was prepared by Elizabeth McCausland printed by the U. Press – A group from these will be circulated on west coast – south and in eastern museums. Though not much to work with, this description did provide a clue: the name Elizabeth McCausland. 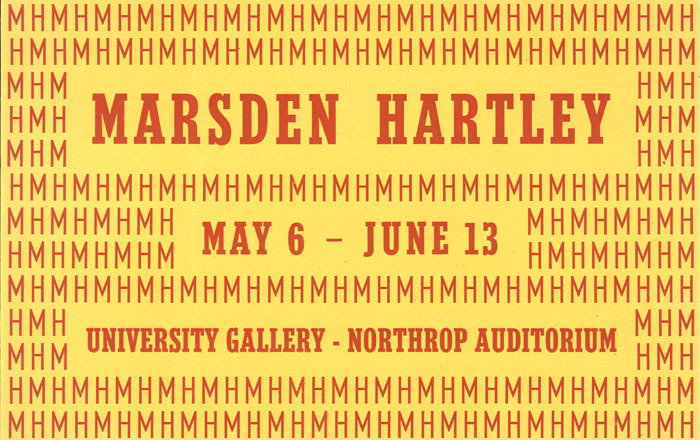 The Hartley exhibit opened on May 5 in conjunction with the release of a publication of a biography of the artist written by Elizabeth McCausland and published by the University Press. The exhibit included over 150 prints, watercolors, and drawings created by Hartley. Further research on McCausland lead me to an archival collection of her personal and professional papers, which are preserved at the Archives of American Art. Portions of the Elizabeth McCausland papers, 1838-1980, bulk 1920-1960 were digitized and made available for research (thank you!). The series, “Correspondence and General Files, 1900-1964, bulk 1950-1964” includes a section of pertinent interest: Box 17, folders 40-51, which contain correspondence with staff of the University Gallery, University Vice President Malcolm Willey, the University Press, and Chairman H. Harvard Arnason of the Department of Art regarding the research for and publication of McCausland’s biography of Marsden Hartley. Additional portions of this series also contain correspondence with Hudson Walker, who owned the Hartley works, but had placed them on loan to the University in 1950. 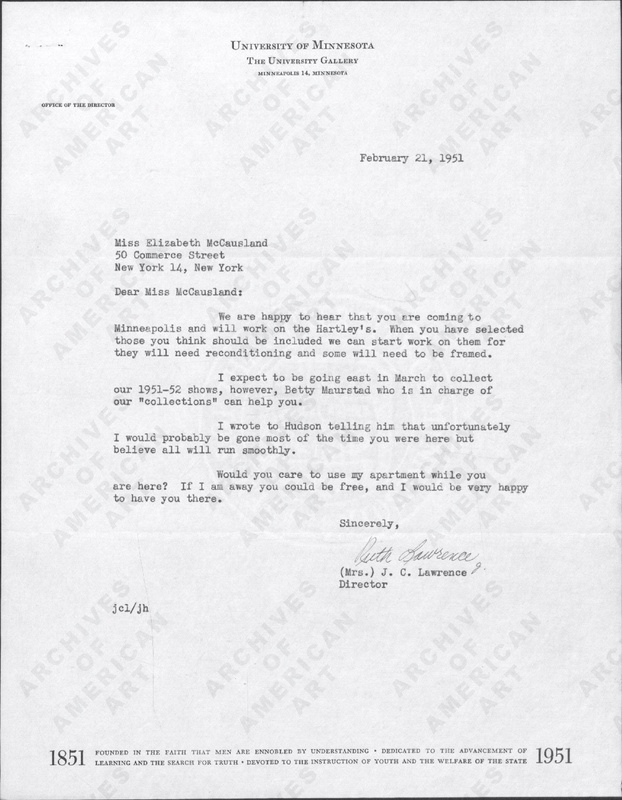 In Lawrence’s February 21, 1951 response to McCausland, Lawrence not only welcomed her to the Gallery, but also offered to her the use of her apartment, as Lawrence would be away from the Gallery on an exhibition collecting trip during the time McCausland would be in residence in the Gallery. Additional letters in folder #44,”University Gallery, 1951-1952, 1957,” in box 17 of McCausland’s Correspondence and General Files outline McCausland’s research, and consist of detailed requests to Betty Maurstad, the Gallery staff member in charge of “collections,” for specifics on Hartley’s paintings. In addition to corresponding about the details of the Hartley publication and exhibition, there are also personal comments between McCausland, Maurstad, and Lawrence regarding pets, news of the day, and family hardships. The correspondence also reveals that the publication of the Hartley book was delayed by the University Press, and that the exhibition had to be delayed as well. 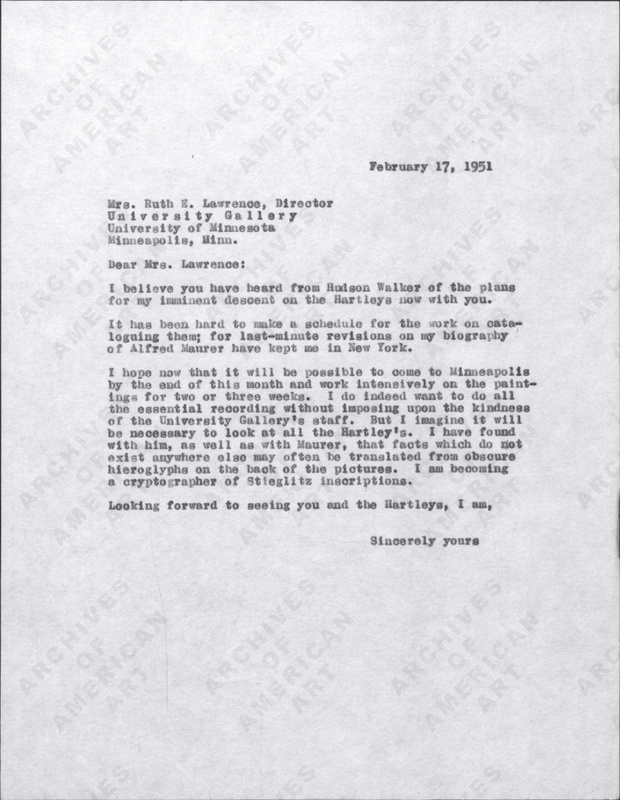 Read through the additional letters in the University Gallery folder, or browse the contents of folders of correspondence with H. Harvard Arnason (Image 42-43), a contract with the University of Minnesota, business with the University Press, and personal correspondence with University Vice President Malcolm Willey to research the alluring archival material that document the 1952 exhibition of the works of Marsden Hartley at the University Gallery.